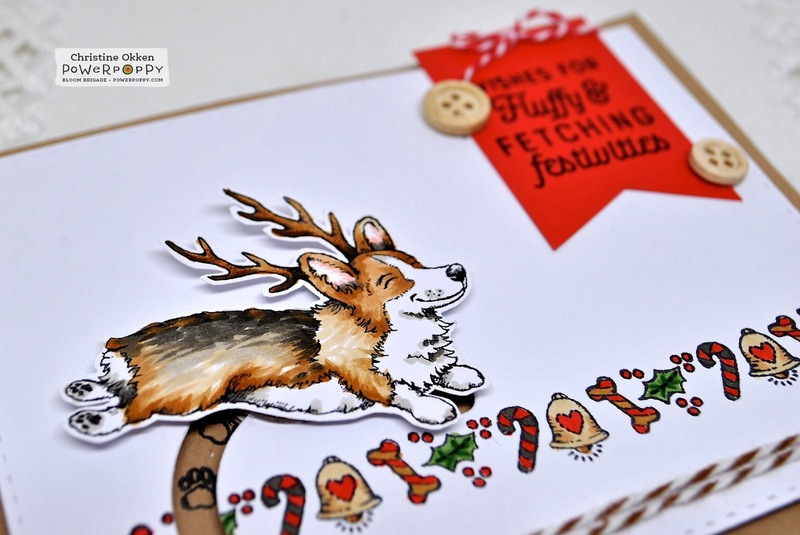 ChristineCreations: Christmas Corgis with Power Poppy! 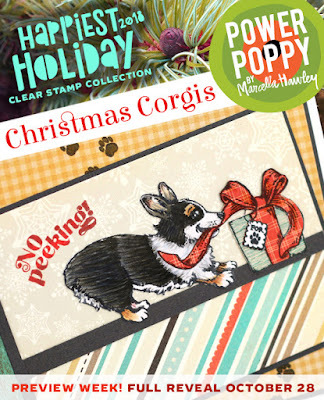 Christmas Corgis with Power Poppy! Welcome to our Happiest Holiday’s Release for 2018 at Power Poppy! We’ll be delighting you for the next 5 days with new stamp sets every day! Today it’s Christmas Corgis! All in honor of the Power Puppy, Tibbs. He may be a real stinker as an actual pet, but in cartoon form, he's pretty cute! Three Corg-centric images with a holiday border snippet and plenty of corny Corgi sentiments. I thought it would be fun to take those short little legs and make Tibbs jump over the line of Christmas decor - but knowing Tibbs, he might eat it all first :). I pulled out a TCP die to create the slider mechanism over the line of stamping, trimmed out our little pup after colouring with Copics and then attached him to the pennies to make him do his little jumping routine. Here’s a closeup of this little cutie. It’s a really CAS style with a stitched die, buttons and baker’s twine as the accents. And you can see I’ve added the little paw prints included in the set within the channel to peek through as he’s jumping. He’s so darn cute! So darn cute!! CAS is perfect for this. 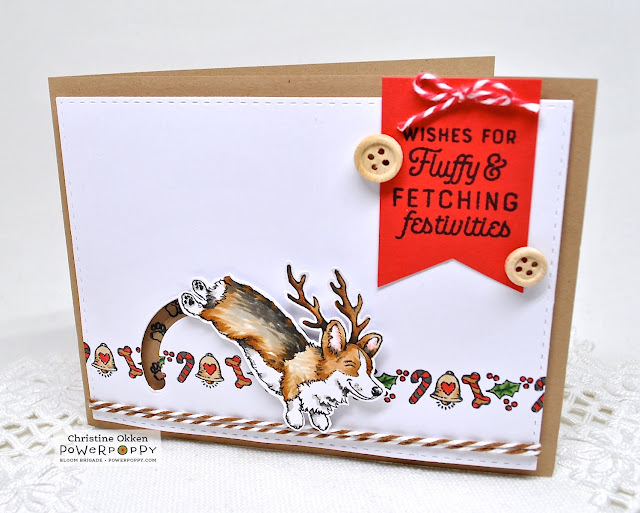 I love the holiday border and how you stamped the paw prints in the channel. Perfect coloring. Absolutely adorable! ahhhhhhhhh this is super cute Christine beautiful made. What an adorable slider card! So fun to see him jumping over the decorations! And I love that sentiment! that is just too cute, I love how he jumps, great coloring! I love the interactive element!! Great card!!! Well, this is about as cute as it gets! Love the little element to make it an interactive creation -- so fun! 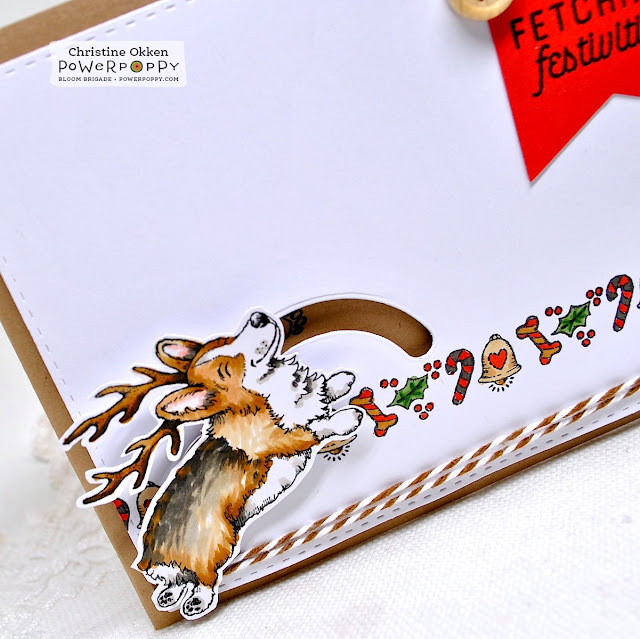 What a clever way to use the slider for this incorrigible Corgi! This is so adorable, love what you did with this stamp. Thank you for showing. Adorable... OH how fun is this, great job.